As Donald Trump continues to describe the people traveling as part of the migrant caravan—largely made up of asylum seekers from Honduras and other Central American countries fleeing violence and poverty—as an “invasion,” his rhetoric is increasingly spilling over into protests against the migrants. Protesters threw beer cans at riot police who blocked their entrance to the shelter as the crowd shouted, “Hondurans get out, we don’t want you here,” around noon in Tijuana’s Zona Norte. Organizers said the event, which began around 9 a.m., was not necessarily anti-migrant but anti-invasion. More than 1,000 demonstrators showed up. Many wore Mexican soccer jerseys, waved Mexican flags, and sang the Mexican anthem. Other messages in a WhatsApp group called “Citizen’s Blockade”—which BuzzFeed News had access to after joining a related, closed Facebook page — included suggestions to deliver pizza and hamburgers filled with pesticide to migrants, and a call to burn down one of the biggest shelters in the city. The group has more than 250 participants. 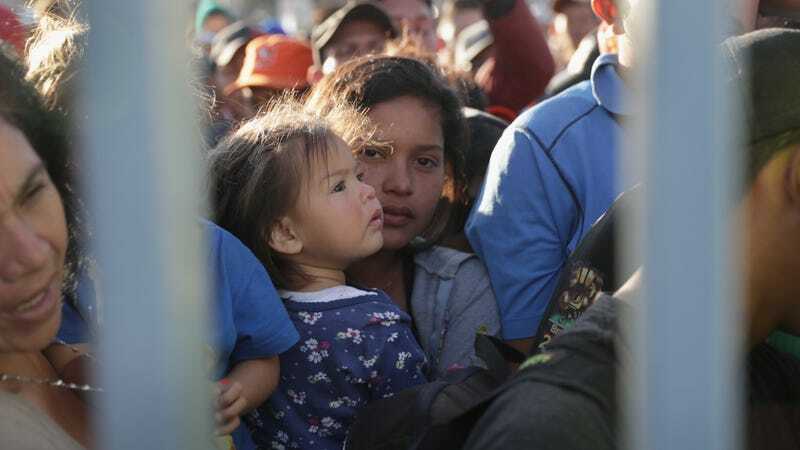 Meanwhile, as asylum seekers arrive in Tijuana, they will be forced to wait as long as two months to even apply for asylum in the United States, according to the New York Times. And last week, it was reported that U.S. immigration officials are pushing for a proposal to “send those who arrive at the U.S.-Mexico border to Mexico while their immigration cases are being processed in the United States,” which would apply to asylum seekers as well. Customs and Border Protection is now so overwhelmed and so insufficiently staffed to cope with the volume that Tijuana’s plazas teem with people who have been turned away. Combined with the many thousands of deportees arriving in the city every month, the net effect is the transformation of Tijuana into one of the world’s great cities of exile. Without a single major aid organization providing significant relief, this flood tide of outsiders is pushing Tijuana toward a humanitarian crisis. So many churches and nonprofits have cleared out furniture and laid down mattresses that the number of shelters has jumped from five to 35 in the past year, and a loose network of volunteer activists has sprung up to help.